It’s amazing how paranoid people are about bees, when it’s incredibly unlikely that they’ve ever been stung by one. One of my neighbours freaked out when he found out about my hive this year. He was sure they were going to attack and kill someone. Then, I asked him how his garden last year compared to the year before. 2009 was much better than 2008. Did he have any problems with bees? No. Gee, I guess the hive I had in my yard LAST year might have helped, huh? I haven’t heard a peep about it since. A friend initially sent me this story (http://www.ktvu.com/news/24130815/detail.html) which they have since updated since it was initially reported as bees. It is amazing how wasps, yellow jackets, hornets, etc. 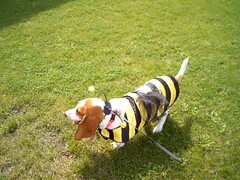 sometimes all get categorized as “bees”. Thanks so much for weighing in here! Do any of your local beekeeping groups have a fact sheet they distribute to the media regarding urban beekeeping? Something like “common misconceptions” about bees or “facts about urban bees”? It’s technically illegal here in Ontario. The Ontario Bees Act requires that hives be 100′ from all property lines which rulles out the vast majority of urban space. The provincial apiarist has assured me that they only enforce it upon complaint, so we’re a bit of an underground thing. Unfortunately, Austin doesn’t really have a good local beekeeping group which blows my mind. There used to be one according to the ancient tomes of Google, but it seems to have been defunct for sometime now.